“I Love Rock ‘N’ Roll” Summer Tour Group It all started with the beat. Before you knew it, Rock ‘N’ Roll was the music of an entire generation! 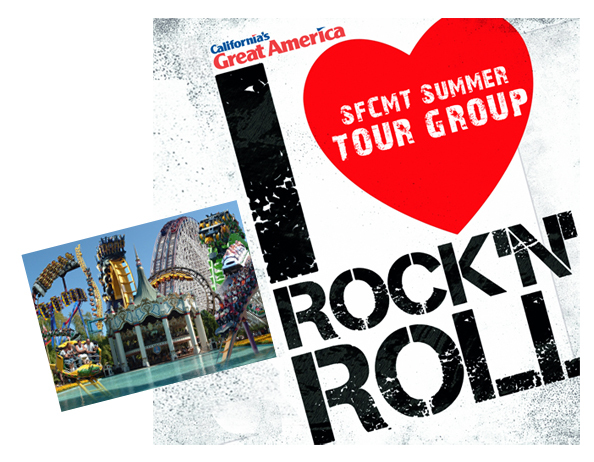 Sing and dance at California’s Great America, then enjoy a fun day at the park with the cast and SFCMT staff! JOIN THE CAST: If you missed auditions on 6/8, but would still like to participate in “Let It Go” or “I Love N’ Roll”, please email us at sfcmtheater@gmail.com and include your first, last name, age and what show(s) you are interested in. Please plan on attending our mandatory parent meeting and first full cast rehearsal on Sunday, June 22nd. Registration will close on 6/22, so please plan on registering on the 22nd. We accept cash and checks for payment. Those who did not audition on 6/8 will have the same opportunity to sing for the creative team on 6/22 before any casting decisions are made. Our fun and convenient 8 week program with “Sunday Only” rehearsals makes participating fun and easy for busy Bay Area families. 7 Sunday Rehearsals: June 22, 29. July 6, 13, 20, 27 Aug 3. Shows: 1 free public performance on Sunday, August 10th at California’s Great America.